Remember back when simplistic flowers like these appeared on home furnishings of every description, from kitchen wall paper and tea kettles to stick-on grippers for your shower or bath? 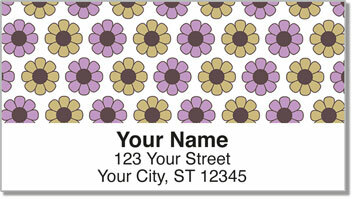 We do, and that's why we asked our designer to resurrect this classic motif for our new Retro Flowers Address Labels. 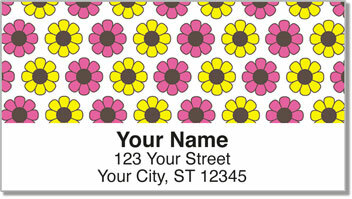 These cool personalized stickers are the perfect choice for old and young hippies alike. 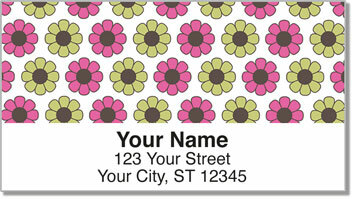 You can use them on all your letters and packages, but you may also like them for identifying items that you loan to others. Wherever you put them, they'll add that special touch of personality that bespeaks your favorite historic era. 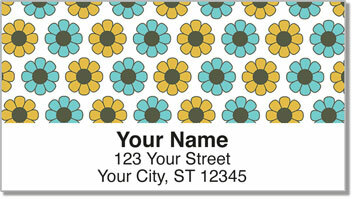 Order yours, along with matching Retro Flowers Personal Checks, now!